Where There is Light, There Can Be No Darkness. 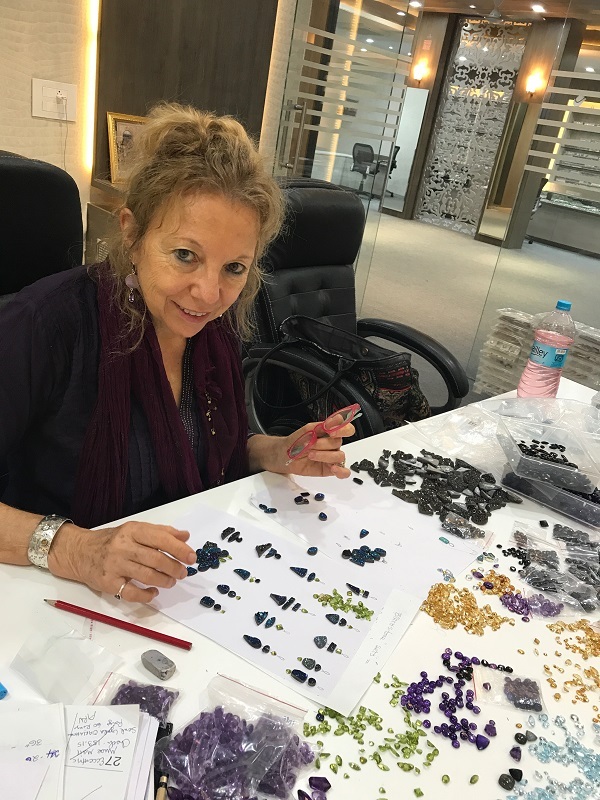 I am on another adventure in India, searching out unique genuine gemstones and creating new handcrafted jewelry designs. 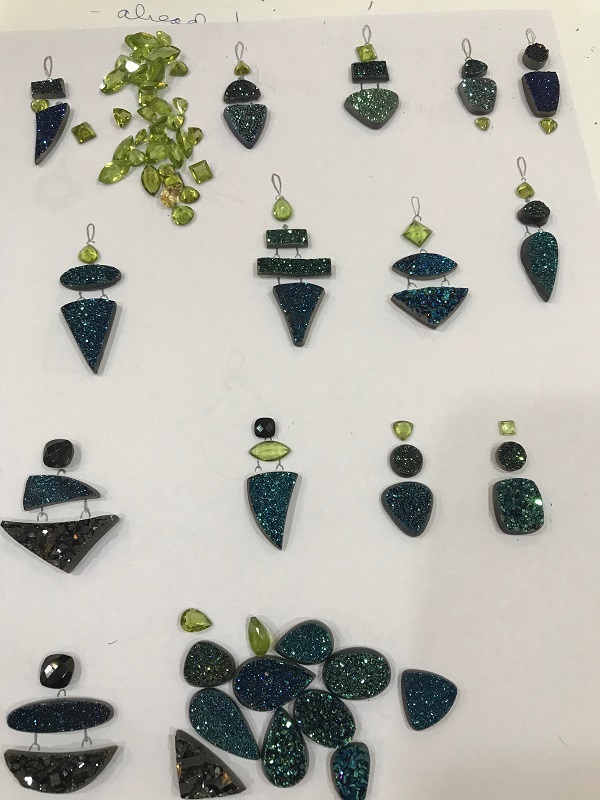 One of my ongoing missions is to find sparklicious gemstones that no one can resist.Here in this picture, I’m working with Druzis and complimenting them with faceted Peridot and Black Spinel for designer pendants. Druzis are desired for their glittering beauty. They are said to amplify and reflect our inner light. Druzi crystals form when natural mineral water washes over any kind of rock, quartz or silica, then evaporates. Over millions of years, the cooling effect on the minerals left behind turn into clusters of sugary, sparkling crystals. Druzis can be found most anywhere, especially near river beds and shorelines. The Druzis I found are mostly all in their more natural free-form shapes, so I am combining them with other stones to be made into unique one-of-a-kind jewelry pieces in designer pendants and rings. I will make earrings with the Druzis that have been cut into matching shapes. Druzi naturally occurs in many different colors. Some of these Druzi pieces that I am working with are coated with a natural metal, Titanium, which adds a blue, green, purple, and golden metallic lustre to the original sparkles. Titanium is the ninth most abundant natural element that makes up the Earth’s crust and helps to balance ions. It is one of the hardest minerals, named after the Greek Titan warriors who were known for their strength of spirit. It takes hours choosing the best glowing Rainbow Moonstone. 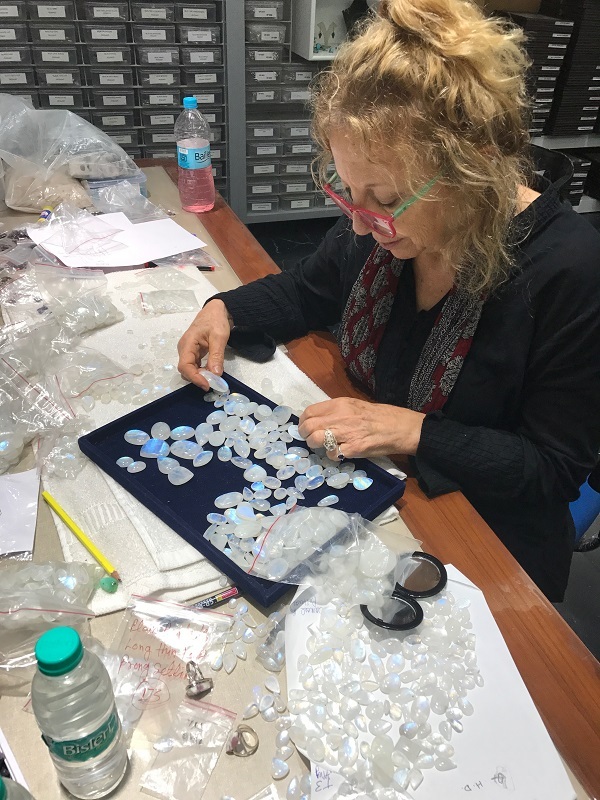 My artisans show me hundreds of Moonstones only from the highest quality lots. I then check each stone for the most all-over brilliant glow, all the while avoiding the ones with clouds, dull parts, black spots or inner cracks. It is rare to find larger pieces without these natural inclusions that are very common in Moonstone. After I hand-pick the choicest pieces, I go through them again to see which position I should set the stone in for its most effective brilliance. I double check them in a mirror because the stone must not only glow while lying down facing the light. It has to glow all over when we wear it as a pendant. I only choose Rainbow Moonstone that shines with an ethereal, silvery, moonlike glow that originates from deep within the stone and radiates out with an opalescent shimmer. Esprit Creations is known for the kind of Rainbow Moonstones that contain a effervescent light that catches the eye and turns heads. One of my customers named our Moonstone, “Dancing Spirit Moonstone”. Besides the dancing spirits, the glow is helped from Feldspar mineral that also occurs in Labradorite, known as the dark Moonstone. Most Moonstone and Labradorite are found in certain parts of India and Madagascar. Good quality Moonstone is becoming rarer to find because it has been mined for centuries due to it’s natural beauty that forces us to notice it.Because I do the work for you, you will not have to look twice at our Rainbow Moonstone to make sure that it glows. Rather, you will be mesmerized and not be able to take your eyes off it! Look forward to our new exclusive designer jewelry collection of sparklicious Druzi, eye-catching Rainbow Moonstone and many other unique gemstone jewelry designs that are presently pleasant works in progress! I will be here another week, and will share more with you then. Meanwhile, if you have a certain design that you would like made, please e-mail me and let me know. This is a perfect opportunity to create your own design!